It’s one of those sayings ‘… till the cows come home’, which, to a farmer, probably means the end of the day, but it can also mean ‘for a long time’, or even ‘forever’. 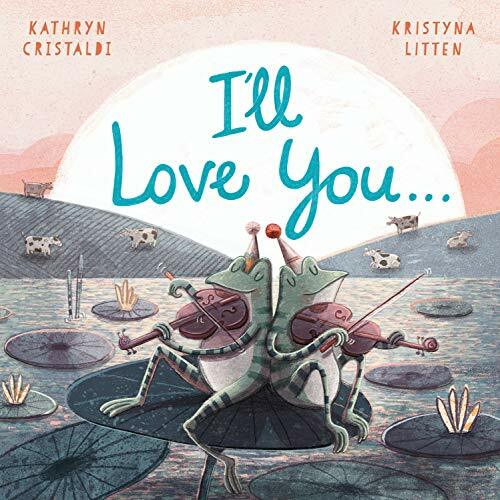 Here former children’s book editor Kathryn Cristaldi plays with that idea, and also the idea of other animals having various adventures, all playfully illustrated by Krystyna Litten. Both women are experienced producers of children’s books, with Krystyna’s output beginning in 2012 with Chickens can’t see in the dark, and now numbers some 35 titles, including Blue and Bertie and Norton and Alpha, with some showing the influence of her parents’ Eastern European heritage. 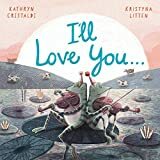 Kathryn has written 24 books so far, including Baseball Ballerina,Samantha the Snob, Even Steven and Odd Todd, but this looks like a new partnership between an author in New Jersey and an illustrator in Yorkshire. We start with ‘I’ll love you till the cows come home’, but where have the cows been? ‘From a trip to Mars through skies unknown in a rocket ship made of glass and stone’, and there are the cows in their rocket. On the next two spread it’s ‘I will love you till the yaks come back, from a jaunt to town for a grassy snack, in a fire truck, or a Cadillac…’ The author’s American point of view is clear, but the rhymes are fun, and the Cadillac is a very distinctive car! It goes on: I will love you till the sheep set sail, then till the wolves return, then till the frogs ride past (these two watery double-spreads are terrific, with sea-creatures on all sorts of wheels) and so on. It’s great use of language, and the illustrations are suitably whacky. The publishers are pushing this as a companion to Guess How Much I Love You, but that’s not necessary- this is funnier, and will settle a child at bedtime with a smile.